Filler, sounds like a dull topic doesn’t it! But knowing the main types of fillers and their uses is important as a DIY enthusiast. I’m going to cover three types of filler here as these are the main ones you are likely to use, there is obviously specialised fillers, but I won’t go into them here. Powder fillers are probably the most common types of filler, they consist of powder that you mix with clean cold water, once mixed it is usually workable for 30-40 minutes and sets within a couple of hours. 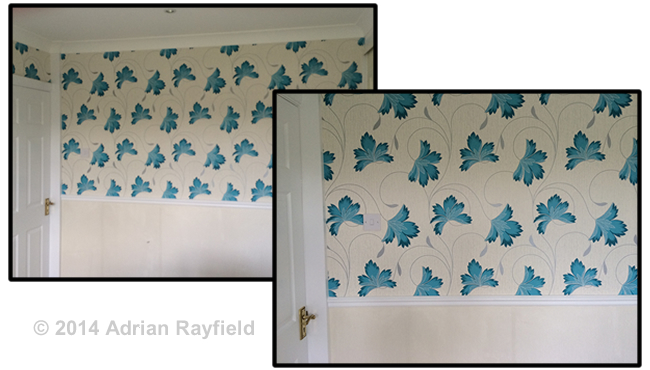 When dry it can be sanded back to a smooth finish ready for decorating. This filler is ideal for small to medium holes, scratches, cracks and imperfections, it can even be drilled and screwed into once hardened. Powder fillers can be used on wood, masonry, ceilings, plasterboard and is normally sold as ‘General Purpose’ filler. Powder fillers are a good all round filler but despite what is says on the box will shrink so be prepared to fill larger holes and cracks more than once to get them level. For larger holes is often best to mix the filler on the dry side but not so dry it isn’t workable, then apply this to the area your filling, then once dry you can put a smoother paste like mix over the top, then sand smooth and level once dry. I have used ready mixed powder type fillers without much success and wouldn’t recommend them as they seemed to give bad performance and were hard work. 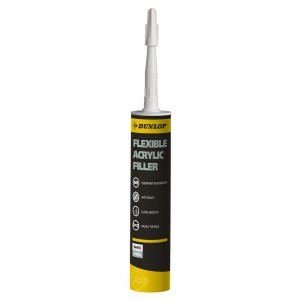 Decorators caulk is a flexible filler used for filling around door frames, skirting boards, ceiling line, coving or anywhere the maybe movement. You can not use decorators caulk to fill holes, cracks or imperfections as decorators caulk can not be rubbed down like powder filler. The whole idea of this filler is to be flexible and if you try and rub it down you’ll end up rubbing it all off as this isn’t a surface filler in the same way powder fillers are. 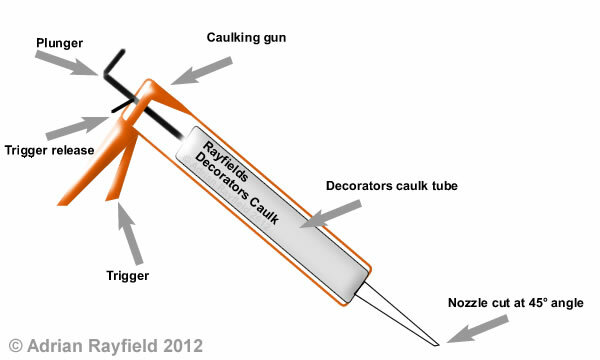 To use decorators caulk you will need an applicator gun , these can be picked up in a DIY store. You will need remove the nozzle to cut the top off the tube of caulk, then replace the nozzle and cut the end of the nozzle at a 45 degree angle, don’t cut too much off unless your filling a large gap. With the tube in the applicator run the nozzle along the gap whilst applying even pressure the the applicator trigger. Once you have applied the caulk run a damp finger along where you have just caulked to smooth it out and to press it into the gap. Then leave to dry. A problem lots of people have is when over-painting the caulk with emulsion, the emulsion tends to ‘crack’ or ‘craze’ on the caulk, if this happens you can go over the caulk again with emulsion to cover this or use paint a primer or undercoat over the caulk before applying the emulsion. This issue is a problem for tradesmen as well as the DIYer. 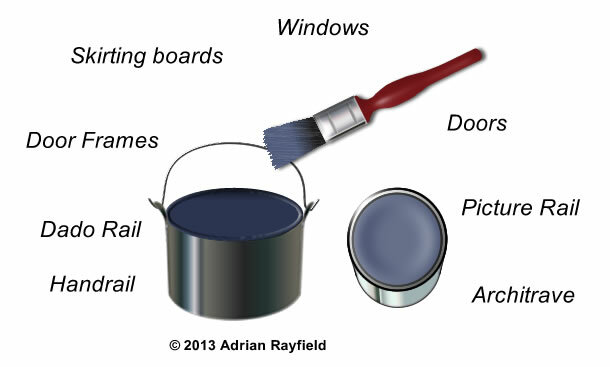 Oil-based or solvent-based paints seem not to have this issue when painting over caulk. Update: I have done a review on a caulk that doesn’t crack or craze, I have been using it for a while and the results are good. Sometimes called 2 part, 2 pac or 2 pack or deep hole filler, these types of filler cure by chemical reaction, to use a hardener is mixed with the filler which react together and sets the filler in a few minutes and can be rubbed down within about 30 minutes. This type of filler can be used for larger repairs it doesn’t shrink or crack but it is harder to rub down than powder fillers. This type of filler is ideal for repairing rotten window and door frames, and is very touch, s much so it can be drilled, screwed and even planed! It is good for interior and exterior repairs but is more expensive that the other two types of filler. I mostly use 2 pack filler for repairing damaged or rotten windows and door frames, one trick I have learned (the hard way) is to mix this filler close to where you want to use it as it sets quickly and by having to walk from the van to the rear of the house, then up ladders you lose a few minutes of it’s workable time and can set before you have applied it all and at the price of it you want to use all that you mix up!